Sliding forward of inside ski (in relation to outside ski) is the natural component of the curved turn. Skis go on different radii, but with approximately identical speed. Therefore, the inside ski, which goes along a smaller radius, slides forward. This can be treated in different ways: actively used, considered inevitable or try to minimize. The last five years I have tried to minimize shifting forward of inside foot. This season there were interesting observations and a couple of techniques. I brought here these photos just to illustrate the topic. I think there is no need to draw any conclusions, except that it is unlikely that difference in legs position is what the athletes watch first. One of the reasons for inside ski shift is the insurance if something goes wrong with the loading of the outside sk. Look at picture with phases of ski turn. In the phase of traverse the slope (the very top of the figure), there is still no turning. 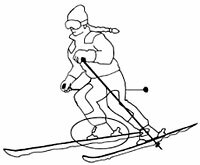 Accordingly, there is no centrifugal force, while the skier is riding on the lower ski. In the first third of thecurved turn (more in the previous note: Slalom, work on the technique in the 2017 season. Shorten the arc), there is a transition to the upper ski, which is about to become external when the turn begins. But as long as there is no turn, there is no centrifugal force. While the support from the lower ski is gone. 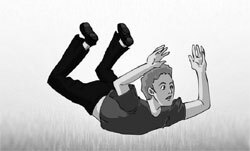 Therefore, the skier starts to fall down the slope. Just fall. Of course it’s best to patience (that is, not afraid to fall!) until the second phase of the turn, when the skis “look” exactly down. Here and the fall is already not to sideways, but to the toes of skis, and this is the equilibrium position. And centrifugal force helps to feel the loading of the outside ski. But what to do while the second phase has not come? Moreover, if something goes wrong, it can also be too late. The simplest and most natural thing is to put forward the iside ski! Moreover, quite often so generally begin to turn. That is, not only put the inside ski forward in the course of the movement, but also direct it down the slope, where the body begins to fall. This is the “active use of the push inside ski forward”. Indicator – non-parallelism of the legs. The outer leg rides to the side, the inner one goes down. It turns out to A-frame and “scissors”. Read more here: “Slalom, work on technique in the season 2016. A-frame“. How to take away the “inside ski forward” in the first phase of the turn? First you need learn to notice the harmful actions of the inside leg: moving forward and loading. Then remove the insurance by inside ski. This can be done at the expense of natural abilities. But it is possible due to additional elements of technique. There are two such elements but enough at least one. The first is edging by knees. Sensations about like in such a static exercise. The starting position – just stand on the skis in a flat place. 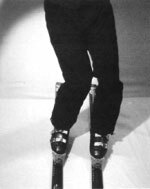 Then, with your knees put the skis on the edges, and in order not to fall, for counter balance bend in the lower back. It turns out also an equilibrium stance, but on the edges. So you need to hang in the turn just after the edge changes. In this case body will not fall down the slope. Note that such a knee angulation in this phase is safe for knees, since there are no overloads. But do not long such stance to following phases. The second element is the smooth sliding forward the outside leg. That is, after load the outside ski, for example, by moving backwards, as described in the note: Slalom, work on the technique in the 2017 season. Shorten the arc there become a support on the upper-external ski. Further, in order not to lose it (and not to flop on the inside ski), it is possible to start pushing an outside ski along the course of the movement. If none of this has happened, there is still good news. 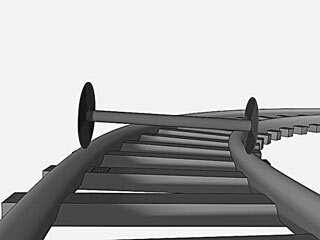 In phase 2, when the skies are looking down the slope, the difference of skis position can be easily removed. But this must be done quickly and decisively, because here that the “rails” begin to work and the inside ski strives to ride forward even more if such a movement has already begun. 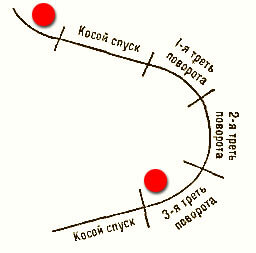 In the third phase of the turn is already beginning overload, so you can not adjust the difference. As you have approached the third phase (this position is near the pole, just like in the upper photos), as you will remain. Apparently, that’s why it turns out for masters, that sometimes there is a difference in skis position, and sometimes not. In this season, relations with the “inside ski run forward” were like this. At first I’ve concentrate on “shorten the arc”. This led to an increase of the “inside ski forward”. I keep it under control for five years, but not in the first place. So I’ve tried to keep it “in limits”. 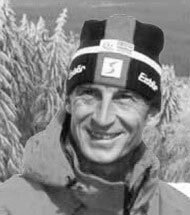 Approximately in the middle of the season, another “giant’s week” was arranged (skiing for GS in 4 trainings on course and 2 in free skiing). At the last training, everything turned out particularly well. Good hard and smooth coating, the course was 24 meters between the gates. On the steep slope there were eight gates, the speed was gained immediately and kept to the finish. Suitable skis, length 180 cm, radius of the side cutout 21 m. Successful radius of the trajectory, so that all the turns were curved cut, from edge to edge. Good speed, much higher than in a free skiing. Time check by “omega”. 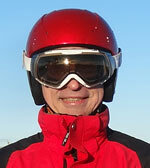 And here colleague Alexander Mistryukov said: “Make the same angles of the edges of both skis, you will go faster”. The giant is good as allows you to have time to see what is happening with skis. Indeed, the internal ski is edged less, and there remains a small “A-frame”. I’ve tried to put an internal knee on the slope but I can not, scary. Not on the parquet ride, if the inside ski is hooked for the unevenness of the coating, then in my case the leg will go to the gap in the groin. Why? Yes because it is too shifted forward! Too – just for this case, in fact quite a bit. And it would be even better if internal leg was behind. Then you can angle edge as you like and do not get caught. That is, if you move both skis relative to the body – the inside pull back, and the outside push forward, then everything would be cool. But immediately move it to the course could not, I need to develop a habit before. After that, I began to delete hardly the difference in skis position. But not removed it yet 🙂 Maybe in the next season?